I love oysters on the half shell, but if they're too big and briny they can kinda make me gag. But, the big ones are good for one thing: Oysters Rockefeller. Oysters Rockefeller were created at the famous Antoine's, owned by Antoine Alciatore, in New Orleans and were named after the richest man at the time, John D. Rockefeller. Antoine's son, Jules, came up with the recipe when there was a shortage of escargot. While there are many versions of this dish the original recipe has never left the family vault, even former employees keep their lips sealed. They've been serving up their famous Oysters Rockefeller since 1899. Finely mince the parsley, green onions and the herbs. In a mortar, mix the herbs with the breadcrumbs, softened butter, and any remaining oyster liquor until you have a textured paste. Season to taste with salt, pepper, Tabasco and Pernod. Spread about a 1/4 inch of rock salt in an oven-safe dish and set the oysters on top, making sure they're level. The salt will help keep the oysters from sliding around and also make a pretty presentation. Spoon an equal amount of the herb butter paste on top of each oyster. Place on the middle rack under the broiler and broil until the edges of the oysters curl and the herb butter paste bubbles, about 5 minutes. Serve immediately. I wonder what dish Warren Buffet would inspire? I think warren buffet might inspire an Omaha BLT (balogney, lettuce, tomato ) sandwich with french's on white. He eats what he understands just like he invests. Sound fundamentals. I was thinking of what Warren Buffet would inspire, then I read Sam Spencer's response. I think Sam is right on. I received for my birthday a wonderful book by Mark Kurlansky...The Big Oyster. (I love it) and a mention of John D. is in there, but not on the naming of the Rockefeller dish, thanks for info. Also thanks for the fabulous photos on each blog!! Yum! We started a weekly tradition at out house last month called Seafood Sunday and we always have oysters. We alway eat them on the half-shell -- raw or from the gas grill. 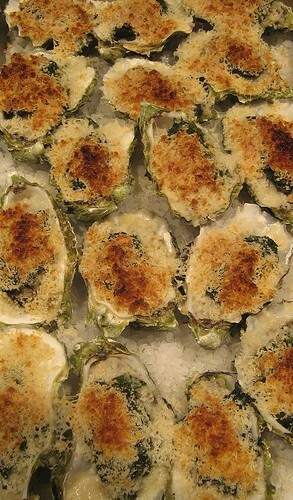 This week I will make your Oysters Rockefeller recipe. Thanks!